Spider veins (telangiectasia) are common the face and legs, however there are several treatment options for this condition including use of injectables, radio waves and lasers. The treatment that works best for your body can be determined during your consultation with our founder and expert. Dr. Katia Meier is an experienced aesthetician and anti-aging medical doctor who has helped many patients over the last decade in the Denver area. Clear Sky Medical believes in integrative health, as everything from nutrition to hormone levels affect how you feel and how you look (skin health). To start your path to a better you, you can call us at 303-790-7860. This treatment has been used for over 80 years and is a standard for treatment of spider veins. Small injections are made into the problem vein, causing it to shrink and collapse. Several treatments are needed and each treatment is 15-45 minutes typically. See our page on Sclerotherapy here. Intense pulsed light technology is another available treatment for spider veins. See our page on IPL and photo rejuvenation to learn more about how this is used to improve your skin. Clear Sky Medical has a long list of skin rejuvenation treatments, some of which can improve telangiectasia, rosacea and erythema. 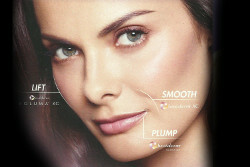 For a full list of treatments you can see our Medical Aesthetics page here.